For images taken in other years, please see the relevant pages, YY 2016, YY 2015, YY 2014, YY 2013. For plants see YY plants. A mild morning with even, pale cloud changed progressively to a blue-sky, sunny afternoon for the September BirdLife Birding and Boneseeding day. Again there were 19 of us. 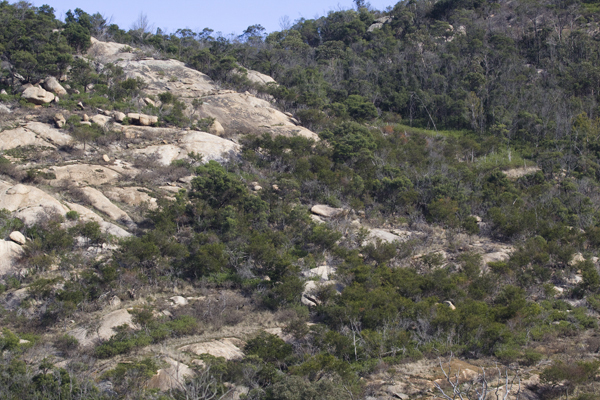 We recorded 56 bird species overall and pulled out countless boneseed plants. 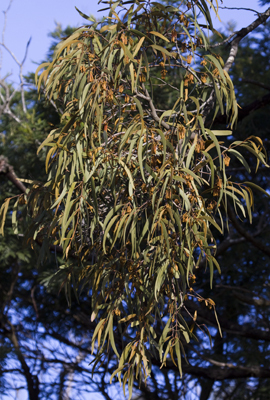 The boneseed were resplendent in their bright yellow, full bloom. Below are some photos from the day. 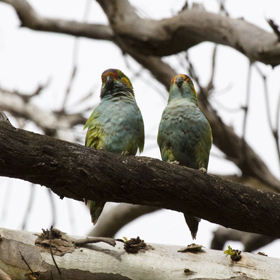 Purple-crowned Lorikeets; out in the open, easier to see than usual. 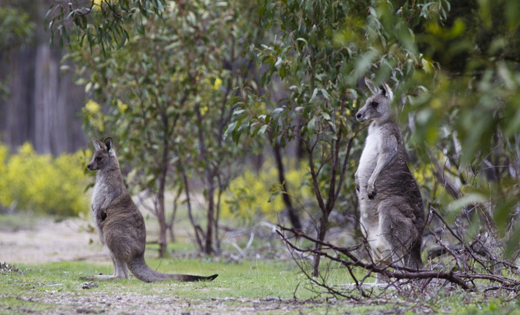 Eastern Grey Kangaroo joey and mother. At Gravel Pit Tor... and further around the Great Circle Drive. 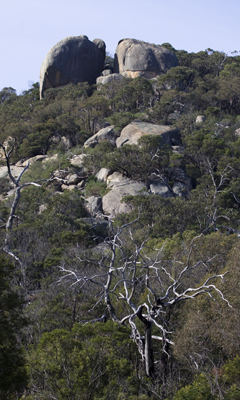 Rocky hill to the south of the Tor. Not the first time I have taken this shot. 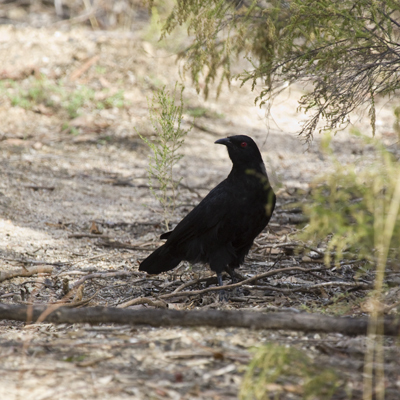 White-winged Choughs in our boneseeding site, very aware of our presence. 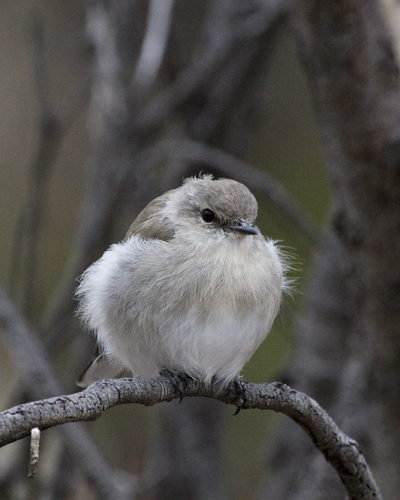 This BirdLife Birding and Boneseeding day was cool, but fine. It began raining just as we finished the last of our birding. With 19 people attending, we pulled out thousands of the invasive boneseed plants at our designated site and still had plenty of time for birding. However, because the sun sets so early at this time of year, we had to keep our eye on the time (unlike in summer when we can bird for as long as we like at each of our usual locations). Our total species count was 39. 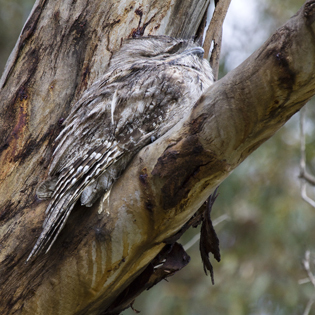 Highlights were the two Tawny Frogmouths near the park entrance (we always try to find them, but are not always successful) and four robin species (Eastern Yellow, Scarlet, Flame and Red-capped). 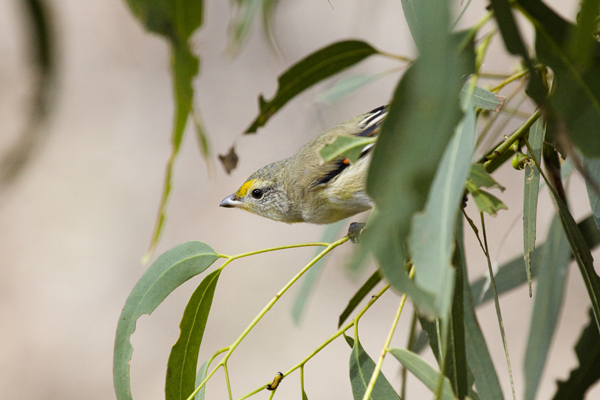 Most of us had good views of Weebills and Spotted Pardalotes. Watching Superb Fairy-wrens and Red-browed Finches bathing together in bright sunshine at the edge of the dam near our lunch table was very special. 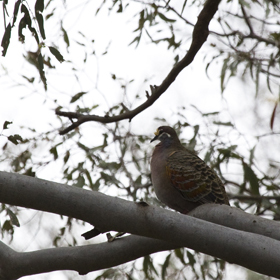 Pity my camera was in the car at the time; sometimes I photograph, sometime I eat. I didn't manage to take many bird images on the day; scenes, rocks, plants and fungi were much easier to photograph. 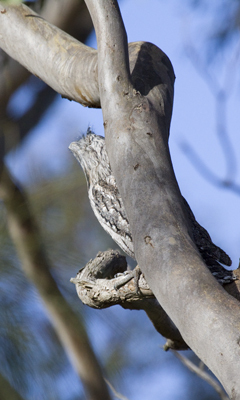 Two Tawny Frogmouths basking in the sun, facing in opposite directions. They weren't too hard to see once someone pointed them out. Gravel Pit Tor car park. 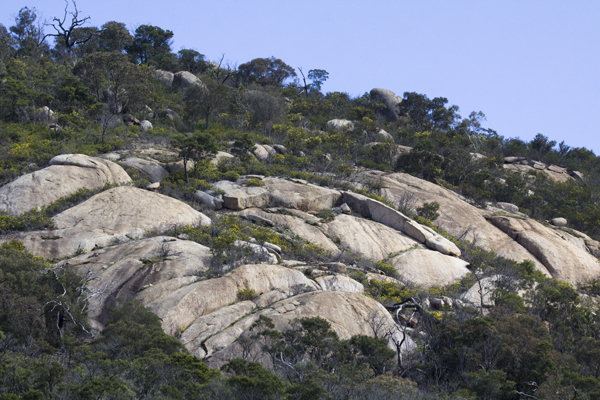 Rocky hills south of the Tor. 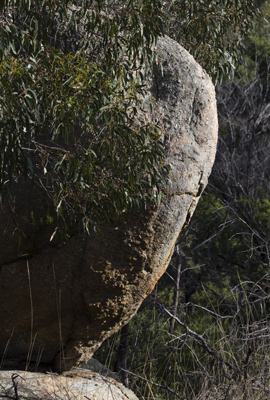 Distinctive rock beside the Gravel Pit Tor track; a landmark at the start of a steep descent. Eastern area, late in the day. Clouds were building before the rain. again (see below, 26 March). 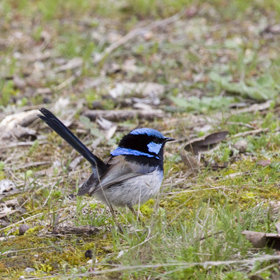 It was a calm and mostly sunny day for the very-well-attended BirdLife Melbourne weekday outing. 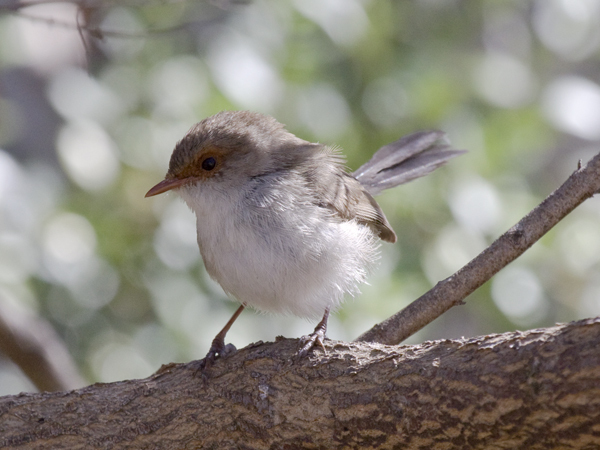 We recorded 51 bird species officially, and possibly a few more unofficially. 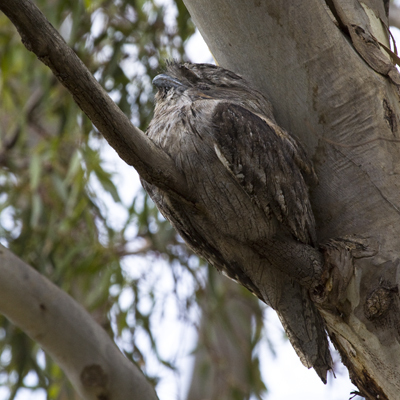 Tawny Frogmouths were in the Park Office area, where we also saw some raptors that had us arguing about identity - all good natured of course. 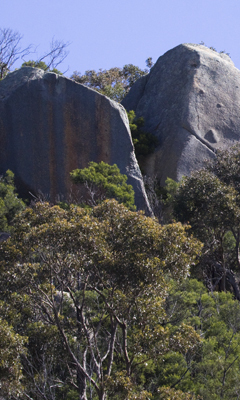 Lunch at the Lower Picnic Ground was followed by another walk with some people pulling out boneseed plants as they went. 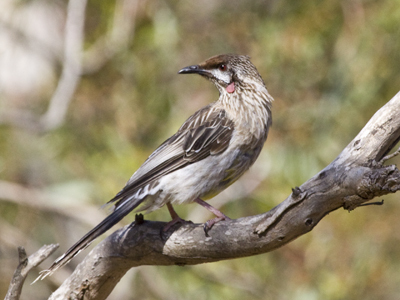 Good to see several Weebills and a Fan-tailed Cuckoo in this area. In the afternoon we drove along the Great Circle Drive, stopping at Gravel Pit Tor and the Eastern Flat area. The latter was particularly productive. 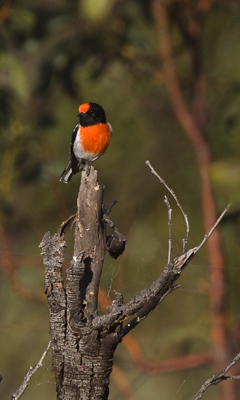 Fantastic to see a pair of Red-capped Robins (male, below right); I haven't seen them at the You Yangs before. Several Jacky Winters posed for us (below left). 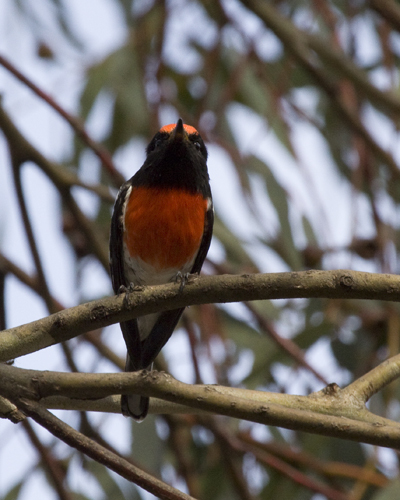 Some people also saw Diamond Firetail, but sadly I couldn't find them. 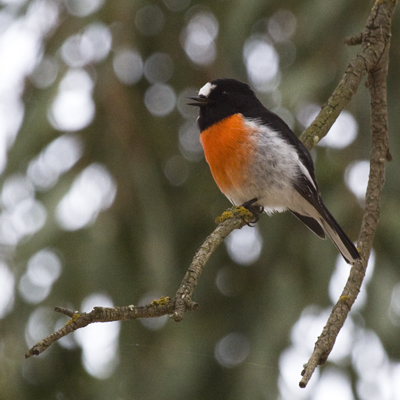 During the day we saw a number of Scarlet Robins; they seem to be doing rather well at present. 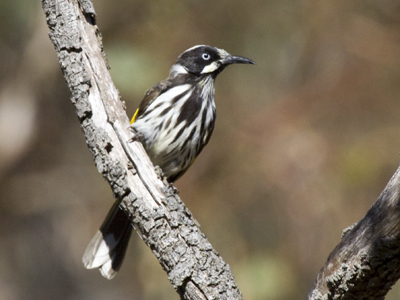 Speaking of doing well, New Holland Honeyeaters were everywhere. Thanks to Diane for organising such a wonderful day. 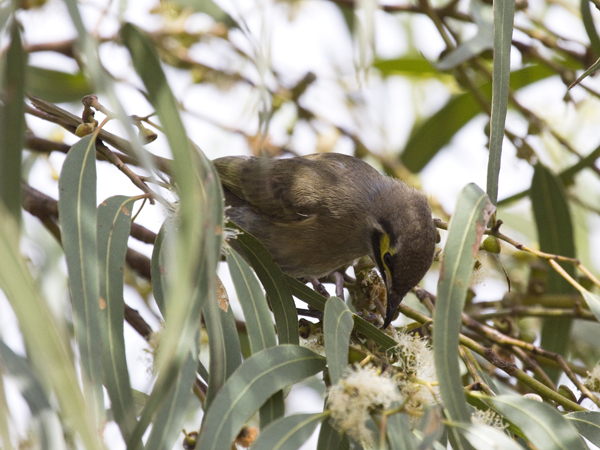 Yellow-faced Honeyeater on flowering eucalypt. 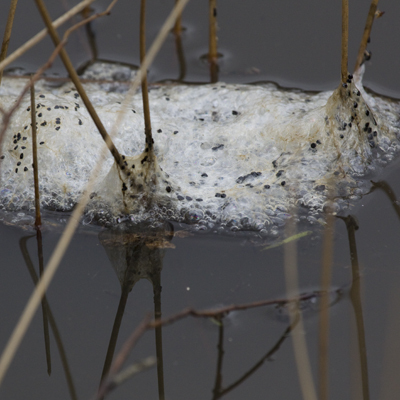 After a rather wet Birding and Boneseeding Day on 3 March 2012 (see below), I returned the following weekend on a beautiful, fine, mild day. Birds were abundant. 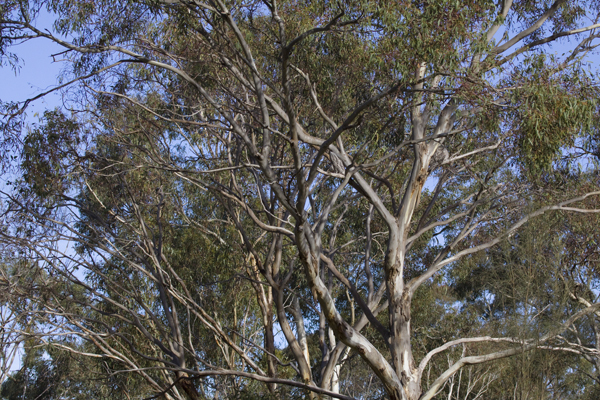 It was particularly good to see a couple of Tawny Frogmouths, lots of Scarlet Robins, and many honeyeaters feeding on flowering eucalypts. 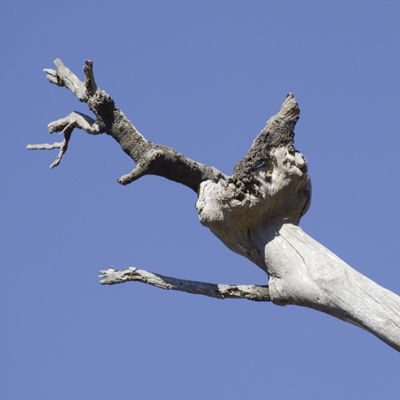 I did a good search for the worst-affected boneseed areas in our site and found a few places that need attention. Next time. 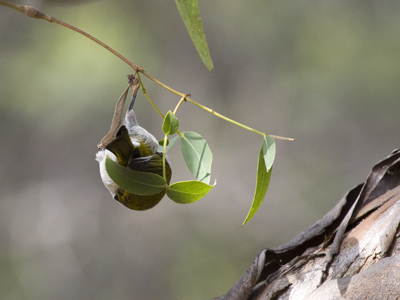 White-naped Honeyeater, hanging upside down to feed. 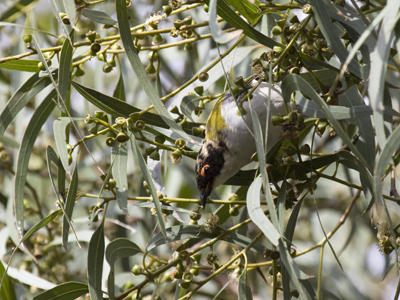 Another White-naped Honeyeater reaching for food. 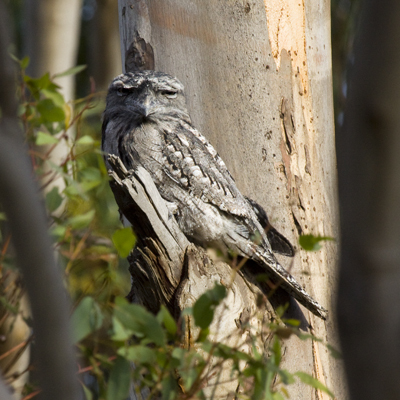 Two Tawny Frogmouths were sitting on adjacent trees; not too hard to find this time. 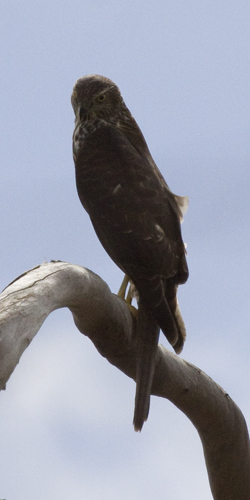 The above young Brown Goshawk flew in to perch on one side of an old bare tree while a group of White-winged Choughs landed on the other side and called at it until it chased off after a smaller bird that flew beneath it. 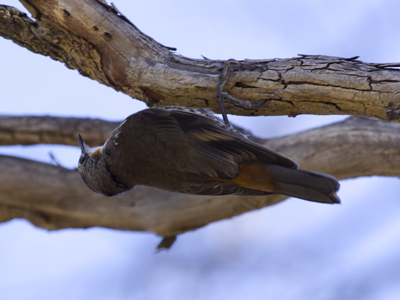 I did not see if it caught the small bird; it disappeared and did not return. 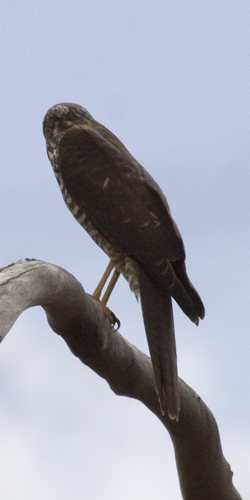 I identifed the bird as a young Brown Goshawk rather than a young Collared Sparrowhawk largely because of the size of the bird, it's beetle brow and the long rounded tail. 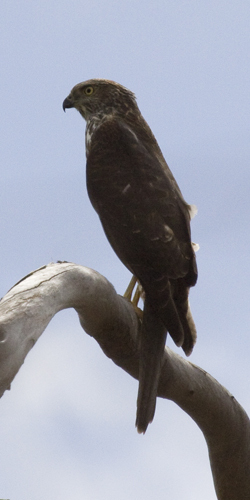 I included three images of the bird because the first gives a better view of the legs and breast, the second shows the profile of the head and the third a threequarter face view. 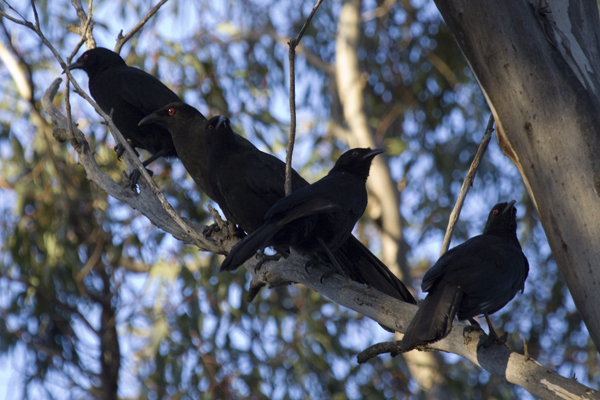 Big families of White-winged Choughs were foraging in our boneseeding site. 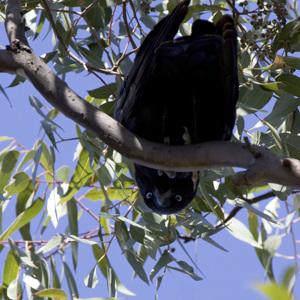 They were very wary and most flew high into the trees when I was anywhere near them. 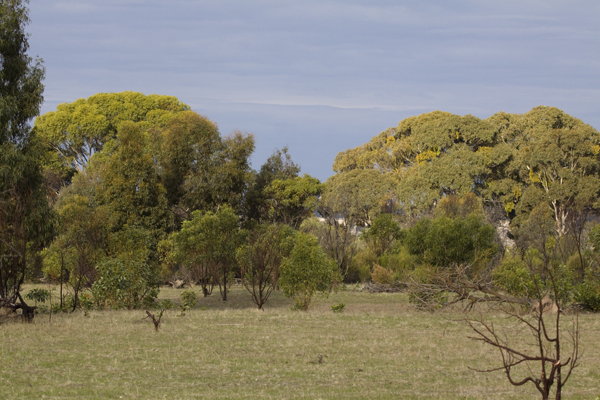 The reduction in boneseed plants in this area seems to benefit ground-feeding birds such as these and the Painted Button-quail that we sometimes see there. 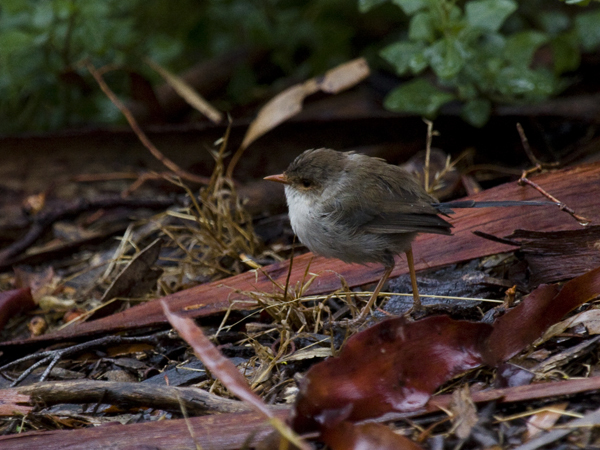 The only bird I managed to photograph on our very wet BirdLife Birding and Boneseeding Day in early autumn was this female Superb Fairy-wren (taken from the shelter of my car). We saw lots of birds and some were quite close, but it rained all day and I didn't want a wet camera. However, the rain was generally light and we were not terribly cold. 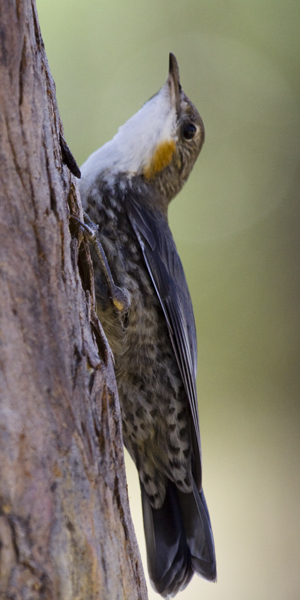 We even ate our lunch sitting around our usual picnic table, in gentle rain, with Spotted and Striated Pardalotes foraging in the trees above us. Despite the weather, we pulled out thousands of boneseed plants at our site. The front and middle of this area are mostly clear of boneseed, but there were plenty of weeds further into the site to keep us busy. 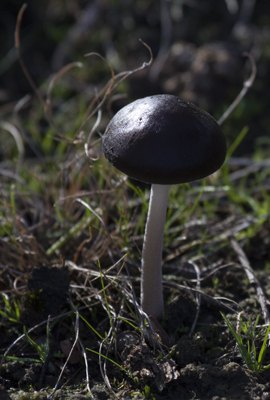 Most were quite small and fairly easy to pull out of the damp ground. 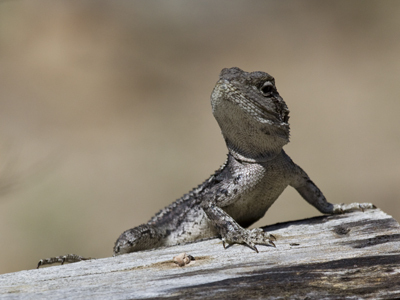 Jacky Lizard sunning itself on a warm November morning. 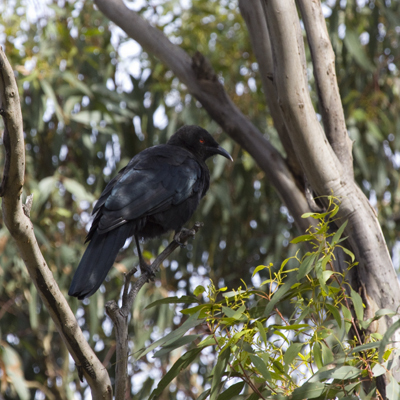 It is so hard to photograph black birds! 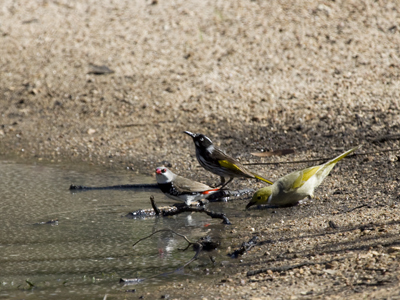 Diamond Firetail, New Holland Honeyeater and White-plumed Honeyeater (right). 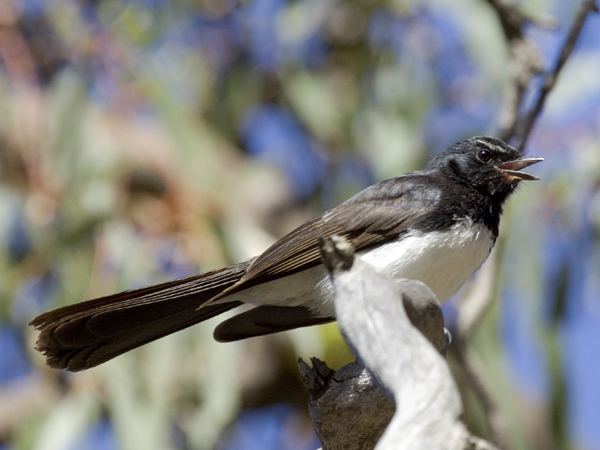 On a warm afternoon in late Spring, several birds of different species were flying about near a dam, harassing each other. Suddenly the three birds on the right stopped for a drink. 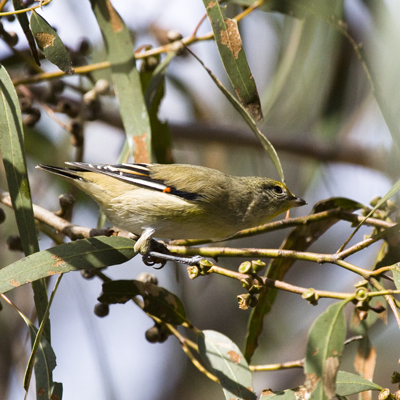 Members of the MELBOCA (now BirdLife Melbourne) Photography Group were visiting the You Yangs that day. Several of us took a similar photo at almost the same time. 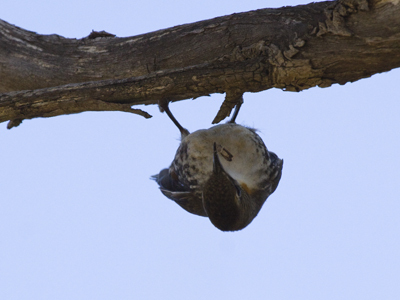 White-throated Treecreeper with captured insect. 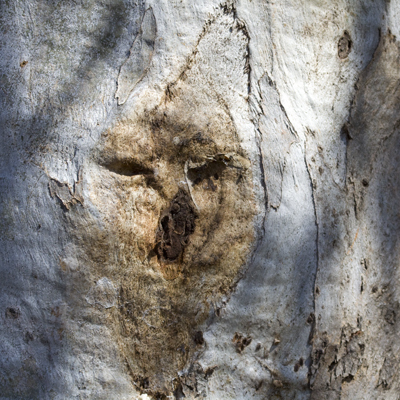 Fox face on tree trunk. Wood Duck with unusual head gear. Reflections in full dam near park entrance. 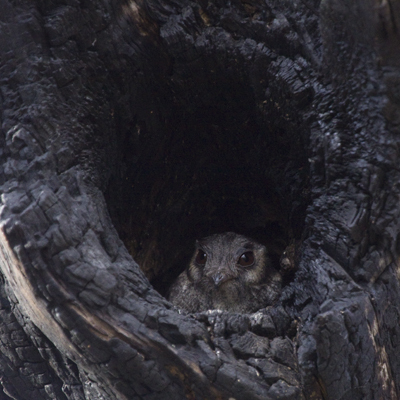 Australian Owlet-nightjar sheltering in an old burnt tree (photo taken 5 Dec 2009).